Home » Are These UFOs Spotted By NASA Astronauts Actually Alien Spaceships? Are These UFOs Spotted By NASA Astronauts Actually Alien Spaceships? Did the Atlantis astronauts see UFOs in 2006? According to this NASA video and audio, yes, yes they did. Watch them spotting not one but three UFOs in front of them and telling Houston about it. It’s a structure that’s definitely not rigid. Doesn’t look like anything I’ve ever seen on the outside of the Shuttle, that’s for sure […] [it] quickly moved to the nose of the orbiter, moving away at least 100 feet. You can actually see them on the last part of the video. What are they? 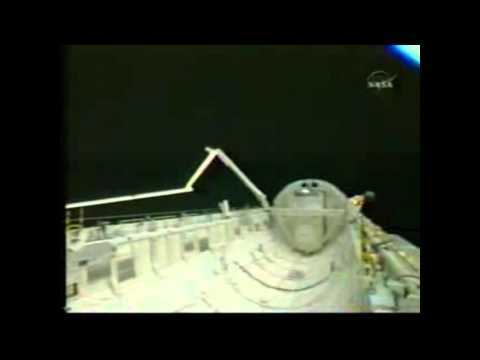 Fast forward to 1:00 to start hearing the astronaut talking about the objects. They spot three metallic objects. Houston replies that it’s probably just a reflection on the lenses, but the astronauts reply that they are definitely solid. Does this mean the UFOs are alien spaceships? Of course not. That’s just stupid. They are just some Unidentified Flying Objects. But hey, NASA’s mission control recordings are always a riot when you are an ufologist. Astronauts see some piece of metallic fabric? ALIENS! Astronauts see some trash moving in orbit? ALIENS! Astronauts had to go poop in their infernal poop machine? Aliens? ALIENS! The truth is that this is just space crap. It just should be tracked because it may be dangerous for the mission—which is why the orbiter has windows and the astronauts have eyes and binoculars. It is business as usual. But, for some reason, ufologists just try to perch everything on the little green men. Which is stupid because everyone knows that the little green men use cloaking devices. And they are not little or green, but Nazis from the dark side of the Moon.